The Holy Grail: supposedly the vessel used by Jesus during the Last Supper the Holy Grail has been the subject of story and song, expedition and exposition, theory and theology- but does it exist? The background and origins of the Holy Grail reveal some clues to answer this question, as well as some pre-Christian roots that some might find surprising. 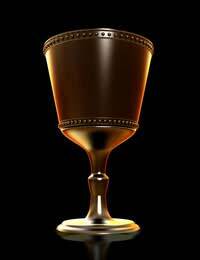 What, exactly, is the Holy Grail, and why do so many seek it? The Holy Grail is the name given to the vessel supposedly used by Jesus during the Last Supper. As such it is often depicted and imagined as a chalice or sorts, while some like to think of it as a plate or a bowl. In many instances it is depicted as a fancy gold chalice encrusted with priceless gems—and thus an artifact worthy of possessing—but as was opined in the movie “Indiana Jones and the Last Crusade” more likely the Holy Grail would be a rough hewn cup, something more like what a carpenter from Nazareth would find to hand at dinner time. The Holy Grail as such isn’t mentioned in the bible; in other words, no where in the bible does it use the phrase “Holy Grail” nor does it reference the cup or vessel used during the last supper as something of significance or power. This, however, does not stop those who pursue this myth with fanatic devotion. The word grail comes from the old French adaptation of a Latin word, gradalis, which is dish brought to a table during a meal. Often the etymology of the word comes from sangreal, which is a made up word created by medieval writers who were building the Holy Grail mythology. But where did the idea that this object exists and is filled with power come from? Chrétien de Troyes is the first writer to put the grail to paper in his poem Perceval, le Conte du Graal (The Story of the Grail) around 1191. Even though this is the oldest known mention of the object, it is not the magical item it seems to be in later writings. It was, however, an interesting enough hook that other writers picked up and expanded the idea, until the Arthurian Cycle is not complete without Galahad’s quest for the Holy Grail depicted. There are pre- Christian roots to the story of the Grail. In Celtic legend, the Rider of the Sidhe posses a cauldron that is magicked in such a way that it can never be emptied. This never ending supply of sustenance is not only handy to feed the troops, it was also possessed of restorative properties, something the grail is also said to have. The Hold Grail has gone beyond myth to become an ideal. These days when something is referred to as one’s “Holy Grail” it is in reference to the quest for the chalice, not by Galahad the pure but by Percival. One of the Knights of the Round table, Percival searched for the Grail long before Galahad, and came quite close, but was never allowed to find it due to his immaturity. Thus the ideal is something that is sought with passion, but is forever out of reach.